Aaaauuuppphhhggghhh. Yawn stretch scratch repeat. And repeat. 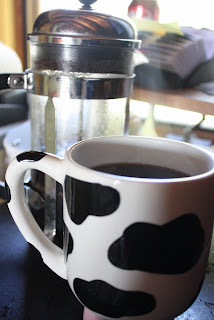 It's Monday, so it must be time for coffee. Let me pour you some. There. Take a moment and enjoy. Close your eyes for that first whiff and sip. You gotta love french press. Well, Saturday was Michigan's opening day of trout season. In case you're wondering, I didn't go. I never get excited about the trout opener anymore. 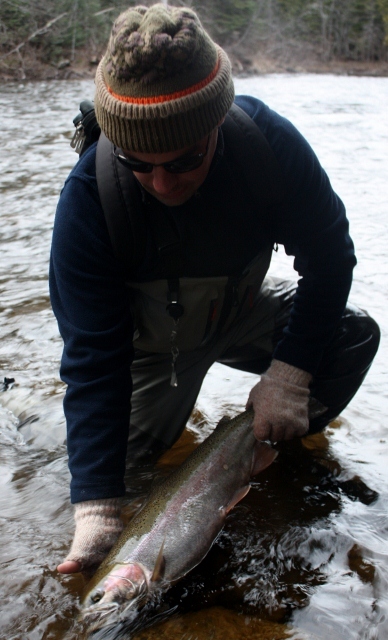 It's always too cold, too many people on the rivers, and hardly any fish. If I wait two weeks everyone disappears, we get some actual bug hatches and the fish come out to play. No, I continued my domestic streak and continued working at home, and I'm happy to report that I have clean floors. 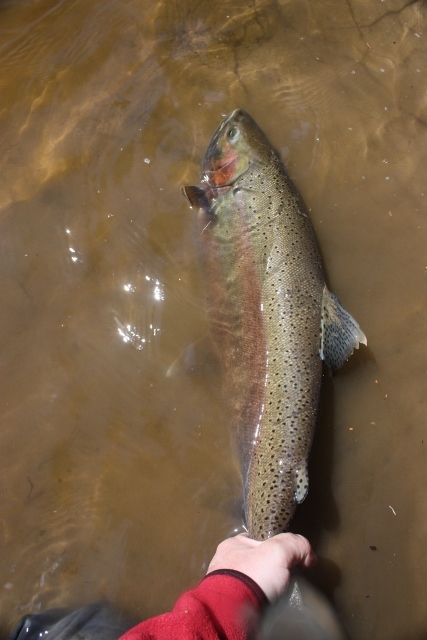 With forecast highs around 70 degrees all this week you can be sure we'll get some bug hatches and the fishing will improve markedly. I did go fish a small lake in the middle of nowhere Sunday night. 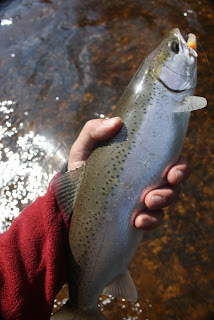 Midges were coming off, and the stockers were feeding like crazy, but I had left most of my stuff at home and didn't have anything to match the hatch. After awhile I just sat there and watched them feed, as an osprey winged overhead. Then while carrying gear back to my car I spotted a Pine Marten. It was thirty feet away, at eye level on the side of a white pine. We stared at each other for nearly five minutes before he took off. Supposedly those things don't live here, but I saw one. It was beautiful. 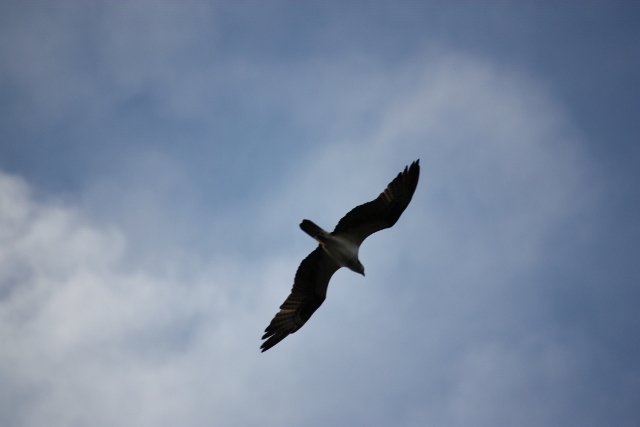 I also saw a fox kit and an osprey too, so I felt the outing was a success. It's interesting how even as this area seems to get more settled all the time it also keeps getting wilder. Not much else to report here. 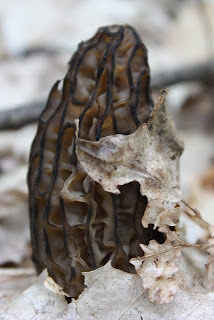 I did find my first morel mushroom yesterday, and with rain and no frost in the immediate forecast it should really get underway this week. Get out and find some if you can. The trilliums are starting to bloom and in general it is starting to look like spring around here, so I'll try to sneak in an evening of brook trout fishing if I can. I had broken a BOA cable on my wading boots which is cramping my fishing a bit. I ordered a repair kit and should have it by the end of the week. 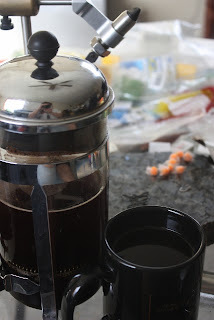 Well, I'm done with coffee, but if you need some more, take a little for the road and have a great week. Let's get after it. One lit match and a flood of memories come back, borne on the smell of sulfur. My grandparents house. I lived there for nearly two years. This is embarassing- lighting a match in the bathroom was considered polite when finished with business. Why were 7 year old kids trusted with matches in a house? Perhaps because I was entrusted with burning household trash from age six, and knew what matches could do. From there I smell sweet hay, leather tack and horses and the pine needles that thatched the roof of our fort. I smell wild strawberries, bland coffee loaded with sugar and milk, my grandmother's treat to us. I smell biscuits, buttermilk, raw oats, greens and black-eyed peas. I smell water cress and trout. I smell those trout frying in corn meal and bacon grease, next to another cast iron skillet filled with peeled and sliced potatoes, all blended with the tannic aroma of a cherry tree. I smell the pleasant warmth of my grandfather, a kindly man who always took an interest in us, and always tried to instill in us his love of all things wild. I smell blood and pain. I smell fear, fear of spiders in the dark, and fear of bears. I smell the fears of four small children, left to fend for themselves, looking after each other as their world dissolves. I smell the terror of being uprooted, the bland acceptance of a new "mom", and the realization that life would never be perfect. I remember my brother's courage. I remember my sister being driven away, until she was a memory, someone I used to know. I remember my grandparents always being there, steady, loving, stolid working-class people who had carved out a spare but comfortable retirement. It was my grandfather's dream retirement, with two miles of exclusive access to a dream stream. That land is a golf course now. I trespass on a regular basis. I trespass to commune with my grandfather, whose ashes have been placed there, right where the brook trout spawn. I trespass to remember my grandmother who walked these now green acres, extending her life and happiness through exercise. 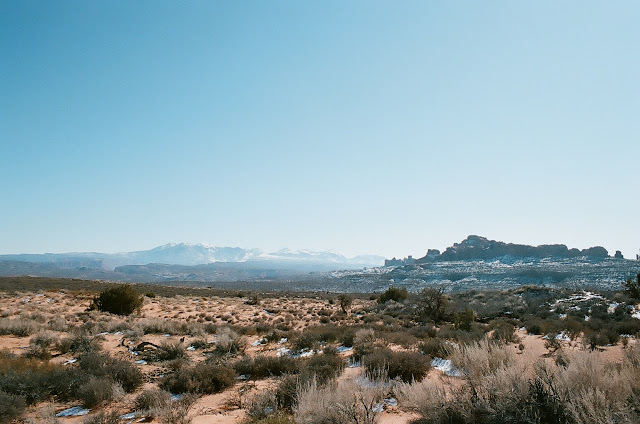 I trespass because it was my home. Auuggghhhh. Yawn, stretch, scratch, repeat. Let's have some coffee. Well I worked long days and had busy nights last week, so I didn't fish much. I've been working, fishing and writing so much since I got back from the Expo that conditions on the home front have gotten pretty medieval. When the weekend rolled around, I decided I needed to stay home and be domestic for a change. It was quite the adventure. First I scaled the mountain of dishes teetering precariously everywhere. It was a grueling climb, and when I got through it the view was magnificent and I discovered that I do indeed have counter tops. Novel. Next I waded into the fetid swamp that is my living room, machete swinging at my side. I folded laundry and PUT IT AWAY. I will get reacquainted with my dresser now, or at least until I lose that little war of attrition again. I wrestled my tools back into their places, narrowly avoiding injury, tossed old newspapers and sorted through mail. Then I faced my most daunting and dangerous challenge- the refrigerator. Talk about a science experiment gone wrong. Again I forged ahead, tossing old milk and orange juice with aplomb, weeding out the mushroom farms and items of dubious vintage. When I was done I could actually see in there. If I ever waste a rotisserie chicken again I'll be sick. Recycling got done, cans and bottles returned, the cardboard boxes that seem to keep showing up on my doorstep of late got broken down and removed from the premises. I'm not done yet. By the time Sunday evening rolled around I couldn't take it and ran out and fished for a couple of hours. I caught three more steelhead, and got my keister kicked by a really big one that took me into the wood faster that it takes to think about. The run is nearly over, and I broke a BOA cable on my Simms boots- not happy about that. My fishing may be over for the next few weeks until I can get them serviced. If you break a boot lace you can usually make do, break a BOA cable and you're royally screwed. Where will this new venture into domesticity take me? 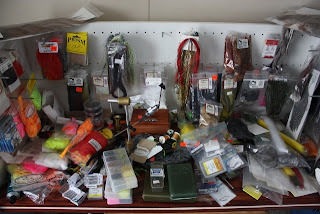 It's hard to say, but I envision clean floors, new blinds and maybe, just maybe organizing my tying bench so I can actually USE it. Maybe I'll set my surround sound system back up, or sell it. When there's no longer a bucket of dirty water with paint tools in it in the kitchen I'll know I've made it. Until then I'll keep at it, face to the wind, sweat pouring from my furrowed brow, my hands smelling faintly of bleach. If you missed it then be sure and read my interview of fiberglass rod builder Shane Gray. I also shared my steelhead season-in-review on Saturday, so check that out. 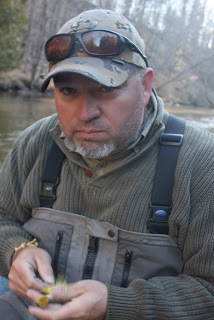 This week I'll be posting my interview of bamboo rod maker Lou Burhart of Brack Hill Tackle. 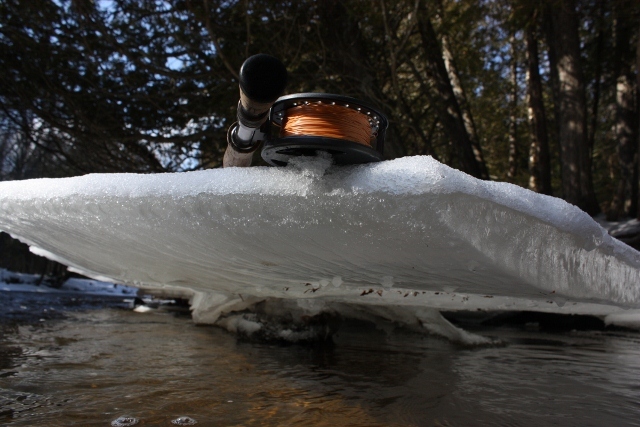 Next week I'll be posting my final interview for awhile, that of Au Sable River guide Kelly Neuman, and we'll be giving away a half-dozen streamers and a nice water-proof fly box to go with it, so be sure and look for that. Well, coffee is over and it's time to get to work. I'll leave you with a picture of my pretty girl from the weekend. Have a great week, get lots done, and if you get a chance, get outdoors, even if it's just for a walk. It's mid-April as I write this. A robin is singing loudly in the pre-dawn gloaming and the grass is greening a little more every day. I should be happy, but I have this faint twinge, a wistfulness. 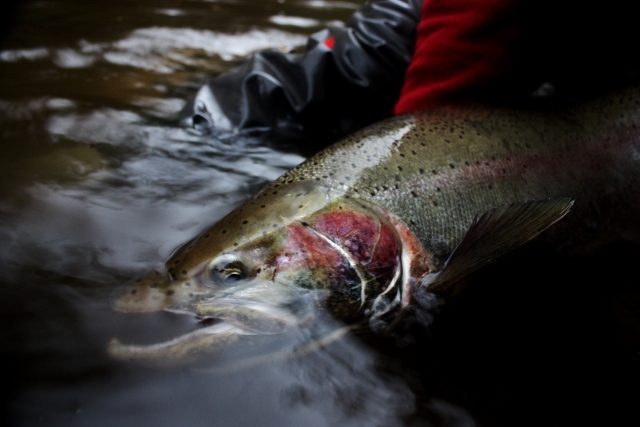 I have had the best steelhead season of my life and it is drawing to a close. I will share my tale in words and pictures, a homage to a great winter spent chasing the silver ghost. 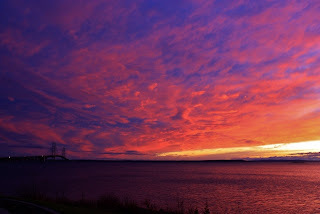 Some of the photos you've seen before, some you haven't, but I wanted to gather them in one place. Here goes. 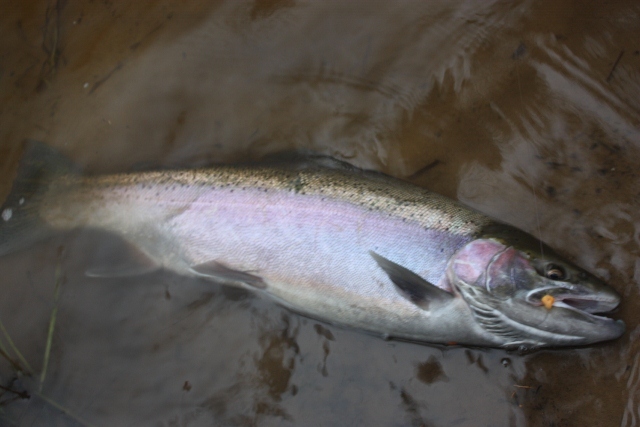 It began quietly mid-November, the carcasses of salmon a reminder of the feverish run pursued by feverish anglers, mostly gone now. After a couple of fruitless outings, success. 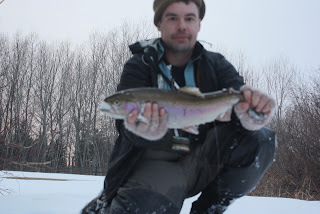 For the rest of the winter I caught at least one of these cookie-cutter fish on almost every outing, all in that 18-22 inch range, all feisty, dime bright, all of them made my day. 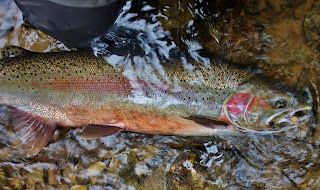 Not the big fish I'm after, just fun, and a sign of life and hope in the darkest of months. I have dozens of pictures of these fish. They all look the same. 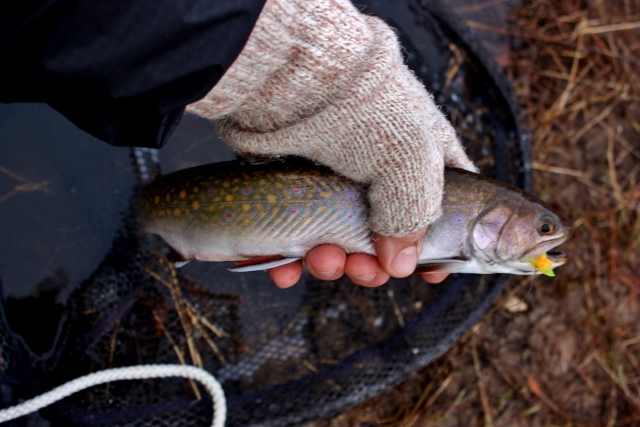 I also caught this small coaster brook trout, 16 inches, spawned out, too silvery to be a river fish. Beautiful. Winter is the dark season, a time for dark contemplation when you examine the shards of your life, the cold air and colder water making you ask those questions you don't want to visit. "What am I doing out here?" Fish-less days, or worse, days that I can't stay hooked up, make me question my skills and sanity. Mid-winter forces a type of mental hibernation, my senses dulled by the muted monotones of winter, pushing my thoughts into shades of gray. Or black. Only the bright colors of the fish speak of vitality. Perhaps this is why I seek them out. I caught dozens of these little trout until mid-January, at which point they disappeared. I haven't caught one since. Mid-February, when the days began to lengthen and the sun began to feel warm again and instill a measure of hope, I ran into this guy. He claimed to be a guide, but his tales were so fantastic that I wrote him off as a consummate BS-er. He invited me to fish with him on a private stretch of river he had access to. I accepted just to put him to the test. On his second drift a large head lifted off the bottom and followed his spawn bag. He hooked up a few minutes later. An hour later I caught this guy- 35 inches long and about ten pounds. What a great fish. 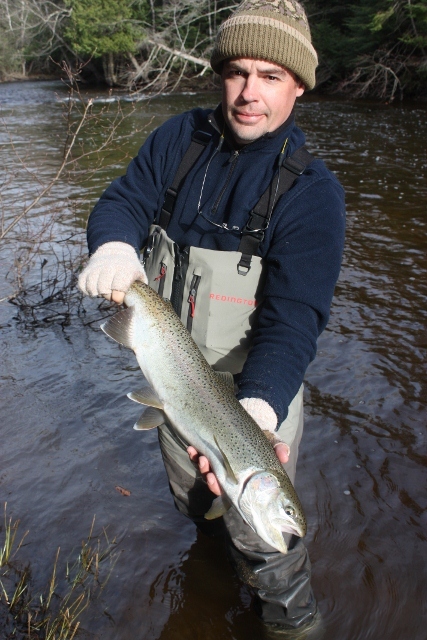 This was my next decent fish, in mid-March. I actually hooked up on eight fish before landing this one. Talk about rusty. In late March came the big storm of the season. Alex Cerveniak and I braved treacherous roads and near white-out conditions to hit the Pere Marquette river. 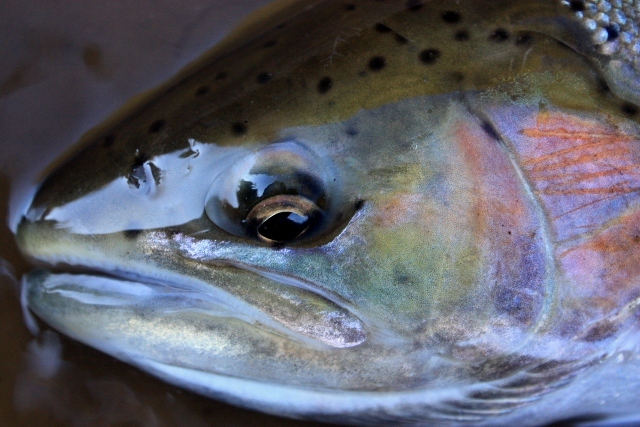 We didn't catch any fish, only some great images. 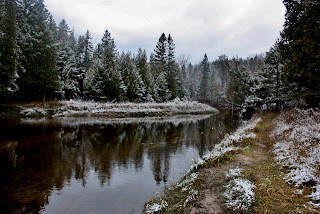 When April rolled around, the rivers filled with 5 pound bucks, all trying to stake a claim near gravel. They were aggressive and fought hard. I caught a lot of these fish. These are just a few. This hen I nick-named "the beauty queen". 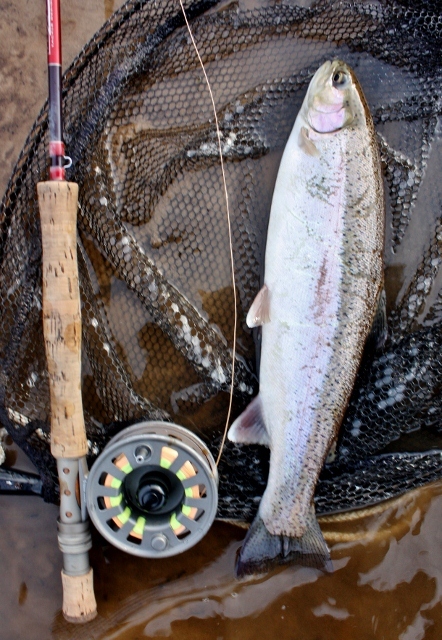 She was bright chrome and very strong, my most beautiful fish of the season. I fished several times with my friend Morgan. She is a fantastic fly fisherman and a lot of fun to spend time with on the water. I tried my best to get her into fish and failed. It was nice to have someone to work the camera for a change though. She tells me steelhead are her sworn enemies now. 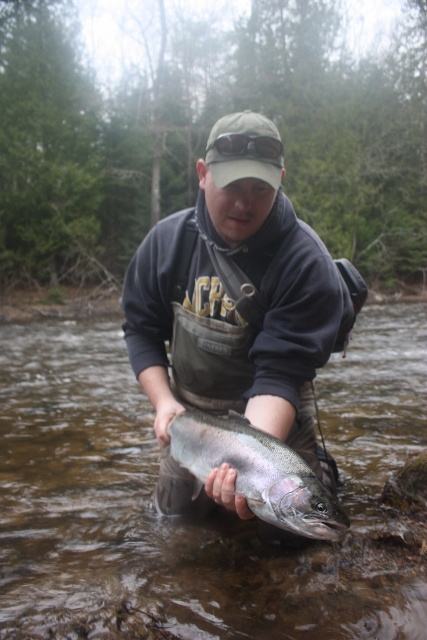 Morgan happens to be dating Matt Dunn, a Pere Marquette river guide, former Third Coast Fly blogger, and current blogger at Fishbeer.com. He's a good writer and good guy. I'm hoping they'll both come stalk the flats with me this summer. Alex Cerveniak joined me again not long ago, and we got into the fish. I landed 5 fish out of 8 hook-ups. It was a great day, and we captured some great photographs. Yet another chrome hen. The spring run has been fantastic for me, and I've landed at least 17 fish in the last two weeks alone. I'm still pinching myself. I love the colors on this fish, especially the orange belly, unusual on steelhead. My season started in November, and unlike some years when the icy grip of winter clamps a fist on your fishing, this year it was gentle and kind. Too gentle. The first snows didn't come until late December, and we had 50 degree weather in January, unheard of here. 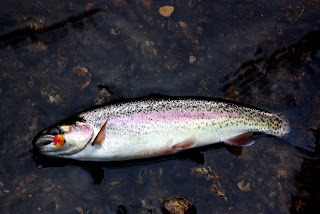 I worry about the condition our trout streams will be in come midsummer. We seem to have shifted back into a normal weather pattern and if anything April has been cooler than normal. Recent rains have blown out the rivers again, giving me hope. Fait accompli. It's done. I can die happy now. 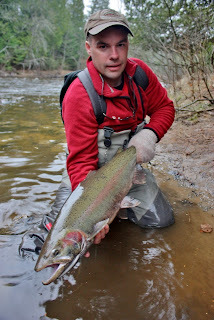 I caught steelhead every month from November until now, and it was wonderful. 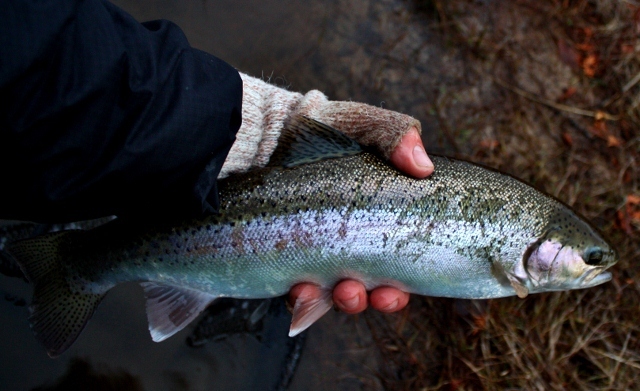 I fished nearly every week, and went home empty only a couple of times. Actually, I never went home empty. 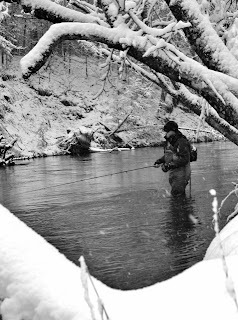 I went home happy and satisfied with days on the water, days spent alone swaddled in wool-poly blend and fleece, while the currents scrubbed away the stress and the silent cedars mutely bore witness to a lone man purging his soul. I caught fish. I caught fish in some of the most beautiful water in the world. I did it alone mostly, and in peace. I am looking forward to summer, to its long days, the boreal nights echoing to the sound of distant fireworks and the cries of loons, the bug hatches, fishing dry flies again, retreating from the summer crowds into the back country to catch brook trout, hunting big browns at night, and stalking carp and bass on expansive flats under cerulean skies to the cry of wheeling gulls and plunging terns. Nothing ends without something else beginning, there are no voids in nature, only the shifting current of life borne on the seasons. There is no fighting it. "Go with the flow" they say, not so much words of wisdom as a statement of inevitability, and so I must, but I know that its current will bring me back to the time when rose-cheeked silver fish, fresh and sassy from a summer of feasting, will enter the streams again and keep me company through the lonely season. 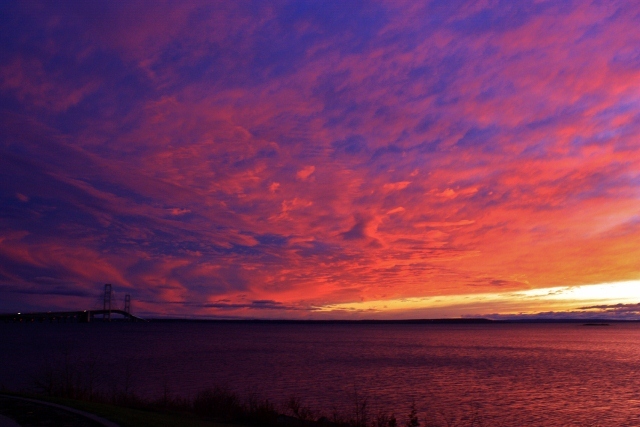 I know that I should cherish summer, but I can't wait for it to end. 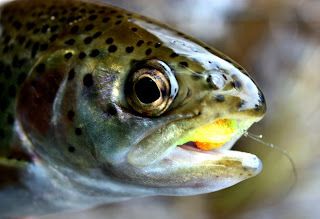 So there I was on the eve of the Midwest Fly Fishing Expo, seated at a table between two strangers, trying to make conversation while not spilling food on myself. I hate those situations. On the other side of the table sat Cameron Mortenson talking to two other people I likewise did not know. At a certain point, my name was said, and the guy on the left extended a meaty paw and shook my hand. "I'm Shane Gray, nice to meet you." was all he said. We talked from there. 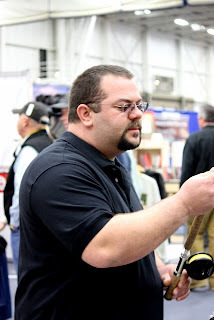 One of my missions this year at the expo was to cast some rods, and when I mentioned this to Shane his eyes lit up, as much as Shane's eyes are wont to do. "Hey, I want you to cast all of my rods" he told me. In case you don't know, Shane builds custom fiberglass rods for his company, Graywolf Products. 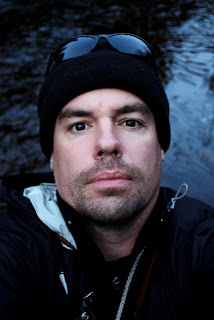 I first became aware of Shane and his work through Cameron's posts on The Fiberglass Manifesto. I'm not a die-hard glass geek, but I drool every time I see the pictures of Shane's rods. They are works of art, often featuring agate stripping guides and rare wood reel seats. There is a waiting list for his rods, and at times Shane has to refuse to take orders until he is caught up with his back-log. I did indeed cast his rods the next day. They were a dream to cast, unlike the cheap and clunky glass rods my grandfather had. I never knew glass could be so light, or cast so delicately. One of the benefits of glass is being able to feel the rod load, and this made double-hauling a breeze. Shane and I stepped away from the hubbub of the Expo for a few minutes and I asked him some questions. Shane is a big man of few words and quiet manner, but when he speaks it counts. Here's what he had to say. FR: What do you do? FR: What kind of rods? FR: How in the heck did you get into building Fiberglass rods? FR: Really? How did he get you into fiberglass? SG: He contacted me about a year ago and thought it was something I should try. FR: How did you know Cameron? SG: Never met him, never seen him before. Never heard of him. FR: Were you into fiberglass rods on a forum or something? SG: No, mainly bamboo for a number of years. FR: Oh, so you were a builder already. FR: Is it ‘builder’ or ‘maker’? Someone else corrected me on that. FR: Okay. You don’t care? FR: You build some really beautiful rods- what’s your formula? SG: Simple. Just try make them simple. FR: I cast your Signature rod- it was a sweet casting rod. How do you make such a beautiful, light casting rod? SG: I think it’s mainly in the layup of the fiberglass that we use. FR: Are you rolling blanks? SG: No, I would like to. I haven’t been able to release the person that is making the fiberglass blanks yet, because of an exclusive deal we’ve got set up. I was hoping to do that a month ago, but still, I can’t name the blank maker. FR: It’s nice having your own proprietary source huh? FR: It keeps your stuff unique. How many rods are you building a year now? SG: I just added it up before the show; around 100 rods a year. FR: How long does it take to do one front to back? SG: About a week or so to build and about a week to finish. FR: I take it you do multiple rods at a time then? SG: I try to. I try to do things in stages, such as turning the grips, or mounting seats, finishing them. I try to finish three rods at a time, that way I can move them right up to the drying rack. FR: Do you have rods on the shelves, or do you have a waiting list? FR: So if someone were to order a rod from you right now, how long would it take to get one? SG: Well, you’re looking at probably August. Maybe September. 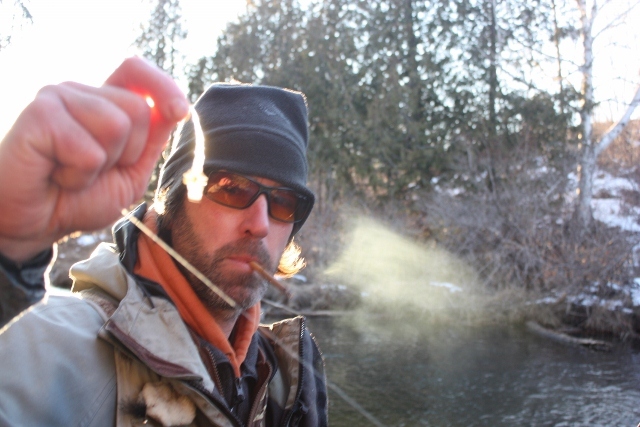 FR: Do you ever get out to fish yourself or are you too busy building rods? SG: I’ve been fishing three days this year. FR: That’s pathetic. Are you going to take some vacation and use one of your rods? SG: I think so. June I’ll try to go out. And definitely September and October for salmon. FR: Thanks Shane, I appreciate it- I love your rods. Casting Shane's rods at the Expo made a believer out of me, and I'm trying to figure out a way to finagle one. He says he's coming up to salmon fish with me this fall. Maybe I can make him a deal. If you're curious or interested in Shane's rods, check out his website. They are definitely worth a look. Auuuugggghhhhh!!! Yawn, stretch, scratch, repeat. Roll on out of bed, shuffle to the kitchen. It's time to make some coffee. Coffee is made, so let's have a cup. This last week felt a little disjointed. My car blew a brake line when I was fishing with Steve Martinez the previous weekend, so I had it in the shop on Tuesday. Not wanting to work on Saturday I worked long hours the rest of the week to make up for it. I did get to fish Tuesday evening with my friend Morgan. She's a local reporter and a good angler and it was nice to have her along, especially since she was driving. 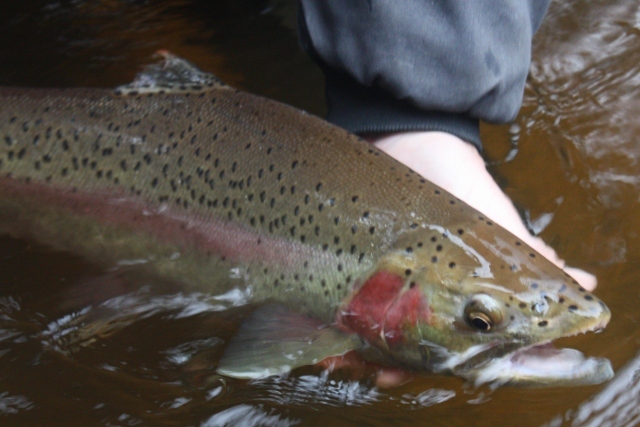 We fished one of my favorite rivers, and I did my best to get her into fish. As I said, Morgan is a really good angler who grew up fly fishing, so she didn't need any coaching from me, and I just put her on the best spots I knew of and fished the marginal water around her. I mention this because I did manage to catch a couple of fish. She didn't. I've been accused by others (you know who you are Mortenson) of cherry picking the water. I must defend my honor. 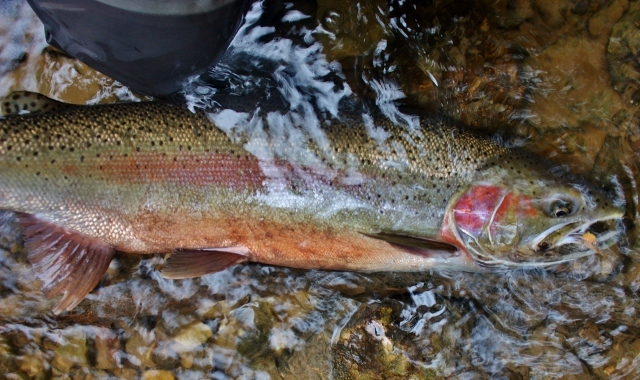 She did manage to hook up on a really hot double-digit fish that took off on a scorching run downstream. It was the last hole, right at dusk. 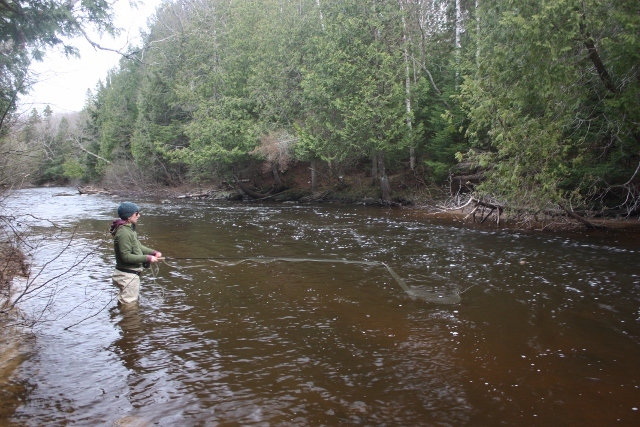 Morgan only had her indicator rod with her, and I had made her use my chucking rod because I know where the fish lie in this run. 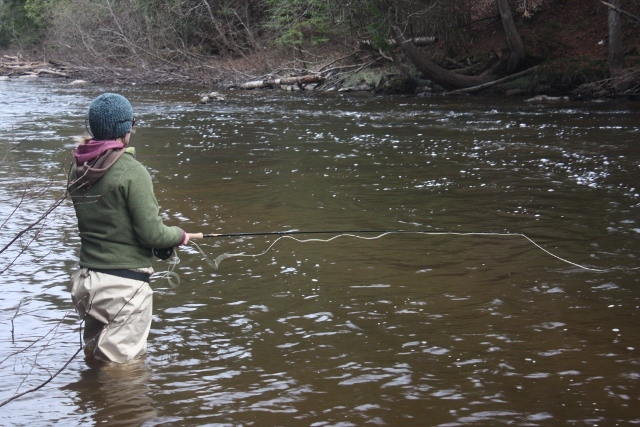 My crappy running line got wrapped around her arm as the fish made it's way downstream and that was end of story. It was nice to have someone run the camera for my fish but I was really hoping to get some good shots of her with one. Next time Mo'. I didn't fish again until Sunday with Alex Cerveniak. We headed out at 6:30 and got started early and fished all day. 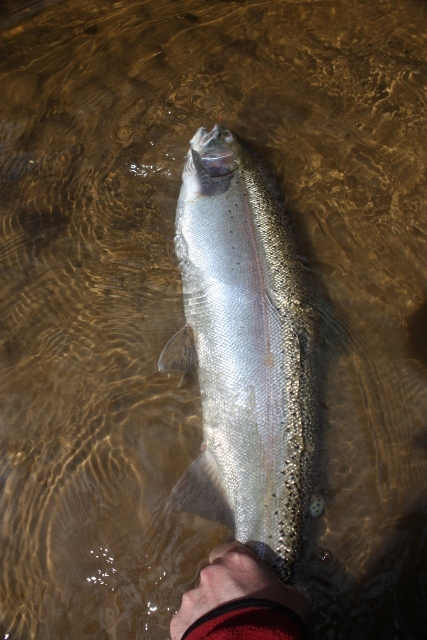 I landed 5 steelhead out of 8 hook ups, better than my average catch ratio. I peeled 3 bucks and a hen off of the back edge of some gravel. They all kept running down to the hole Alex was fishing and you would think he would get tired of having to stop fishing and wait for me to land my fish, but honestly we both enjoyed photographing these fish and got some great shots, and it's not my fault he also insisted on indie fishing. 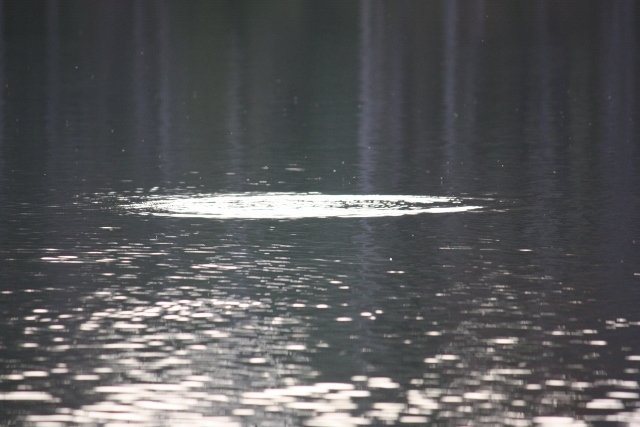 On our way back out I spotted a small pod of fish and got another five pound buck there. Then I worked a pocket in some fast water that always holds fish. Sure enough, my line came tight and the water erupted but just as things were getting frantic my line came flying back to me. 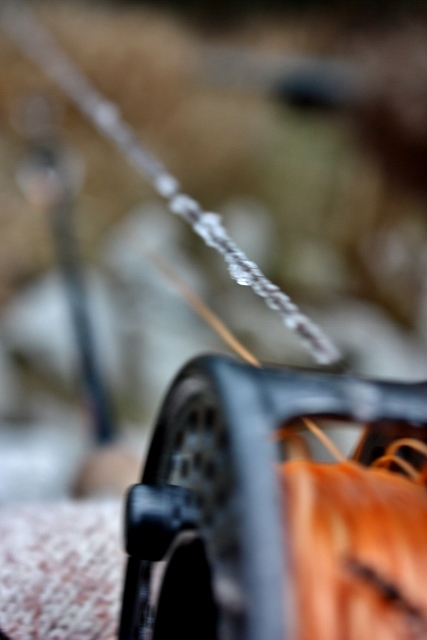 When I checked my tippet it was badly frayed, probably from the last fish running me through the rocks. Oh well, it was some fantastic fishing. With all of the local runs winding down rapidly I have a feeling this is the end of my steelhead fishing until November. Well I was negligent, or overworked, you choose, and didn't get the next interview done last week. I'll do my best to get my interview of fiberglass rod builder Shane Gray done this week. I have two others besides- bamboo rod builder Lou Burhart, and Au Sable river guide Kelly Neuman. Kelly has put up a half dozen streamers and a really nice fly box to give away, so be sure and look for that one. Monday Morning Coffee Reader Loyalty Giveaway. 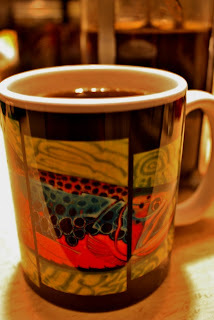 Speaking of giveaways, it is time for me to reward my loyal Monday Morning Coffee readers. 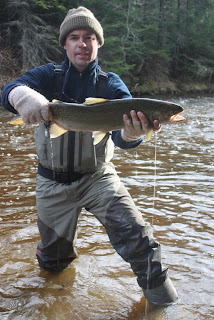 The trout opener is coming up in two weeks here in Michigan and I want to help you get ready. The good folks at Rio have sent me 4 Power Flex tapered leaders in 5X and 6X and some hats and visors from Fishpond. Enter your name and email address in the form below and I'll draw four winners tomorrow after 5 PM. The short entry window is to reward my loyal MMC readers. I know you're out there. If your name is Sanders and you never read this before Friday- sorry dude, I'll send you an FR sticker as soon as I get around to making them. Okay, it's time to go to work- let's get after it. Yaw-aww-awwn!!! Errrggggppphhhh. Yawn stretch scratch repeat. It's Monday again. Let's have some coffee. Here, let me pour- is that good? Great. Well, I saved all my fishing for the weekend. I worked all week at getting the April Vokey interview finished and then it took two nights for me to get my gear together for the weekend. 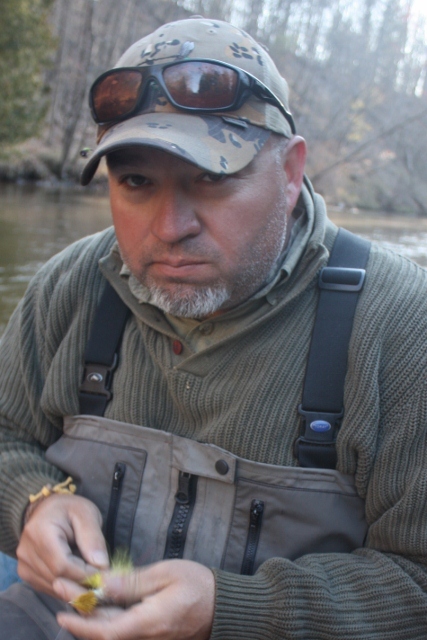 I had a trip lined up for Saturday with Pere Marquette River guide Steve Martinez of Indigo Guide Service. 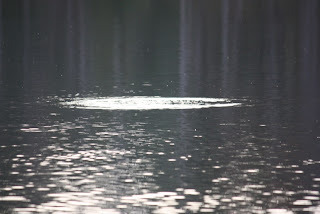 I drove down to Baldwin Friday night, and we floated all day Saturday, from 8 AM t 8 PM. If I ever wanted to know what the limits of my fishing skills are I found out Saturday. I blew so many chances at fish that I felt sorry for Steve. Mind you I got cheap-shotted by a bunch of fish. For instance, I hooked up on a very large fish while indie fishing which subsequently swam straight at the boat leaving me with my rod high in the air and my line stretched all over the place. A little slack and presto he was gone. 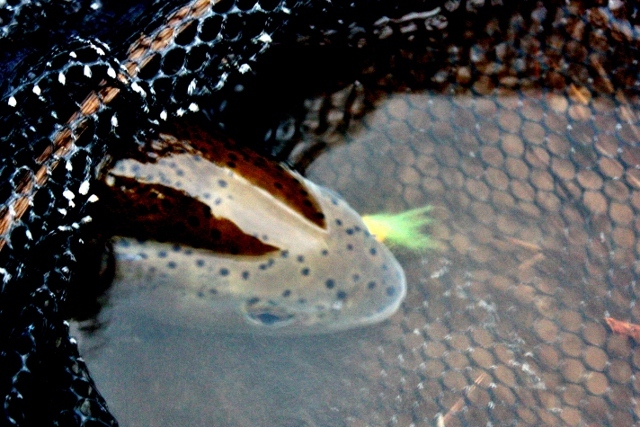 Then there were the two big browns that hit my streamer as I began to roll-cast. With all my line arcing through the air there was no way to set the hook. A whole bunch of fish hit when I had my streamer stripped back in and had paused it while I looked for my next cast. This kind of thing happened many times over Saturday, but on at least six big fish I missed the hook-set plain and simple. A couple of these fish were real dingers. 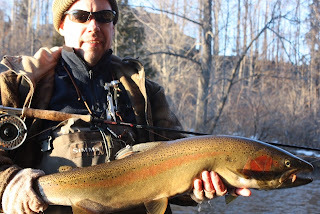 Finally I hooked up on a decent fish toward the end of the float- it started flopping around on the surface, and then I lost hold of my line in my rod hand. Slack = no fish. So if you've ever thought "that Fontinalis guy is a great fisherman" the answer is a firm "no". I'm just a regular guy who fishes a lot. Even a blind pig sets a hook better than I do. I want to thank Steve for taking me out and putting up with me. I really had a good time, the river was beautiful and it was a lovely spring day, I just couldn't keep up my end. Sometimes that's fishing. I'm not beating myself up too badly though. I went steelhead fishing Sunday in my home waters and caught four. The first hen was about six pounds, spawned out and tired. I let her go without a photo- most ladies don't like to be photographed when they're not looking their best. 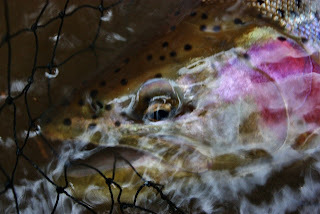 The next fish was a very small hen, about 20 inches, that I hooked up on 60 feet below me while indicator fishing. 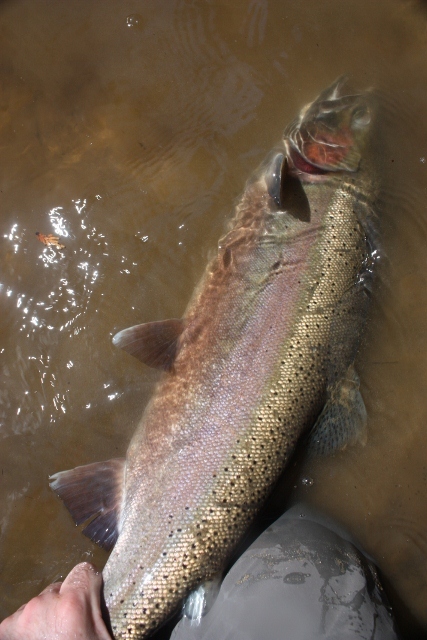 She fought like a fish twice her size, and was beautiful chrome bright. 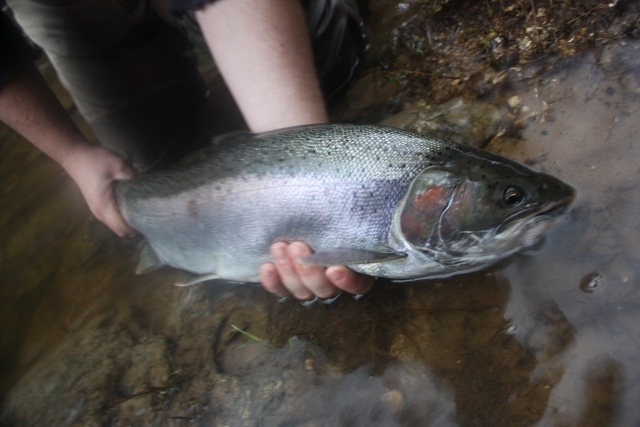 I went a ways up stream and got another hen, this one about six pounds, chrome bright and beautiful, easily the beauty queen of my spring fishing. It took about ten minutes to land her. For my last fish I stopped off at a hole I had already fished and changed things up a bit. On my second cast I hooked into a 6 pound male that took me round for round for more than ten minutes before finally sliding to rest on the sand. 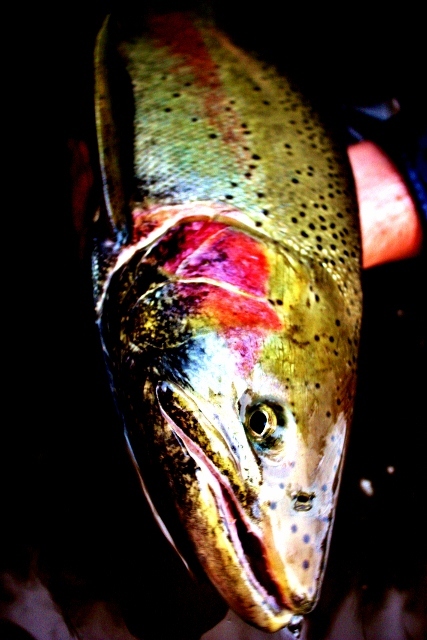 He was colored up but still fresh and strong. It was a cool way to spend a Sunday. It had started out cool and overcast, but the sun came out and lit up the place. The fishing was a little slow actually, but made up for by the fish I caught. One other detail about my weekend was that I was very sick the whole weekend. I had a fever and chills and muscle aches, and that feeling you get like you're starting to hallucinate. I tried not to let Steve know how sick I was, but he could tell and kept asking about it. I tried taking cold medicine, but it didn't help much. The defense rests its case. If you haven't already, make sure you check out my interview of April Vokey. Nothing to win this time, just a good interview. My next victim will be Shane Gray of Gray Wolf Products, builder of fine fiberglass rods, so look for that to post later in the week. And congratulations to Steven Ebling for winning last weeks drawing. He won a signed copy of Eric Stroup's book "River Pimp". 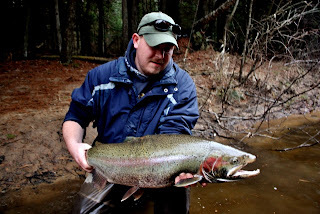 I've had several Michigan guides invite me to fish with them lately, including Steve Martinez, so I'm starting a new series of articles called The Guide Line in which I profile Michigan guides. It should be very interesting. If you've ever wondered about what a guides life is like then stay tuned. I'll highlight the fisheries, the business, and the men and women who toil at the oars every day living the dream. With my back-log of posts to get done it will be at least a couple of weeks before I finish the first one, but I'll keep you posted on progress. Okay, well, it's time for work and I must run out the door.